In a recent Thrive Analytics/YP study, The Why Before the Buy, we uncovered the “why” before consumers’ purchasing decisions. Now, we’re bringing those findings to you in a conversational, live webcast series, featuring a variety of guest experts who will use the results of the study and digital marketing best practices to teach you how to win more customers by improving your online presence. In a recent Thrive Analytics/YP study, The Why Before the Buy, we uncovered the “why” before consumers’ purchasing decisions. Now, we’re bringing those findings to you in a conversational, live webcast series, featuring a variety of guest experts who will use the results of the study and digital marketing best practices to teach you how to win more customers and build your brand with mobile ads. In a recent Thrive Analytics/YP study, The Why Before the Buy, we uncovered the “why” before consumers’ purchasing decisions. Now, we’re bringing those findings to you in a conversational, live webcast series, featuring a variety of guest experts who will use the results of the study and digital marketing best practices to teach you how to win more customers using search engine marketing. 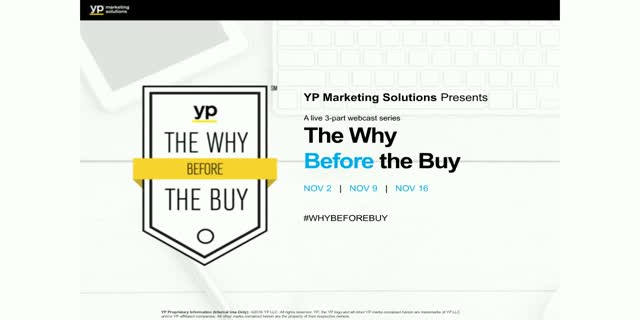 A 3-part live webcast series from YP that teaches local businesses how to leverage digital marketing to come out ahead of their competition.